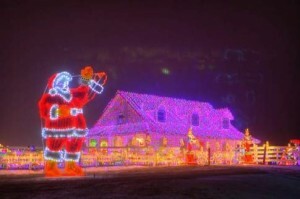 The Christmas Ranch in Morrow is one of our favorite places to visit during the Christmas season. Not only are the displays beautiful, a portion of the proceeds goes to help two local charities, Shriners Hospitals for Children and The Neediest Kids of All. 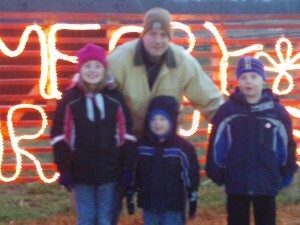 We headed out to visit The Christmas Ranch on Wednesday evening. They open at 5:00 pm; if you arrive before 5:30 pm, the $12.00/car entry fee is waived; if you wish, you can still make a charitable donation at any of the shop cash registers. This year, The Christmas Ranch is also offering Wagon Rides from 5:00 pm – 9:00 pm, $3.00 per person; children 3 and under are FREE. We opted not to take the wagon ride because we were getting chilly; the warm bonfire with plenty of seats for a crowd looked more appealing to us! It takes 350,000 LED lights to make this show happen, as well as the choreographed music. My kids love dancing down the pathways but moms be warned: it’s MUDDY! Think boots when you’re leaving the house. My chilly (and blurry!) hubs & kids. We had a good time but after about thirty minutes in the cold, we were ready to head home. 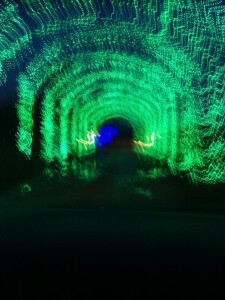 Driving through the tunnel of lights as we leave. The long drive out of the parking lot is beautifully lit, too; hopefully, your little one will be awake to enjoy the tunnel of lights. 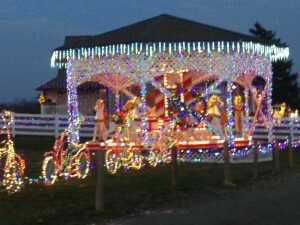 The Christmas Ranch is open through January 2, 2010. 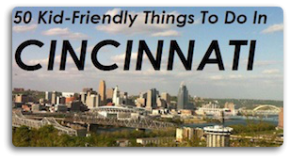 To get all the details you need to know before you go, click here. We visited the Christmas Ranch. It was Great!!!!!!!!!!!!!!!!!!!!!!!!!!! With as much land that is out there it would be great if they had a iceskating. The atmosphere puts you in the Christmas mood, very family friendly. The quaintness of the shops and unusual ornaments are great. Anything you may be looking for, for Christmas can be found there. I hope to see an eatery or larger dining area next year. It was over crowded with the 3-4 places to sit in the one shop and the wait for the funnel cake was long. It ranch itself was not overcrowded and the family was there working the ranch. If you love Christmas lights you must come and visit. We plan on making this one of our annual places to go during the holidays.